← XI. the red tape that I couldn’t clear. On my first recce trip to USS, I met Rudith there during our lunch breaks. She orientated me to all the locations and explained what I could and could not do The main purpose of this trip was to confirm the proposal hot spots as well as to find places for Gideon and Caleb to camp at while they were capturing the moment. I took lots of photos and videos and sent it to the both of them via WhatsApp so that they could get a visual idea of where they could plant themselves without being spotted by Huiyi. The plan looked really promising as the Pavilion had Far Far Away in the background and I could imagine that with a sunset added, it would make a spectacular backdrop for an equally spectacular proposal. In my mind’s eye, I got excited thinking about how stunning the photos would eventually turn out. I tried asking for special passes for their entry since they weren’t going in to enjoy the rides but to just snap photos. USS declined my request, which I could understand. So on my way out, I purchased two tickets for the two of them. I didn’t have a choice, really. So I was grateful that DBS was running a promotion with USS and tickets were sold at a small discount. But I realised the first problem. Unless Gideon and Caleb had excessively expensive camera lenses, there was no way they would be able to capture close-up shots. The entire proposal would also be seen from only two boring perspectives and none of our facial expressions would be captured. On my second visit to USS, the main purpose was to enter during sunset to ensure that the spot which I had chosen had the sunset in the horizon, and that the crowd would have started to disappear. Much to my shock and horror (but eventual relief), the sunset actually took place where Battlestar Galactica was and not at Far Far Away! This looked like a plan that was doomed for failure because it didn’t contain the all-important sunset criteria! Die. Back to the drawing block. The third plan was officially far far away from success. Next chapter: the relentless schedule that week. 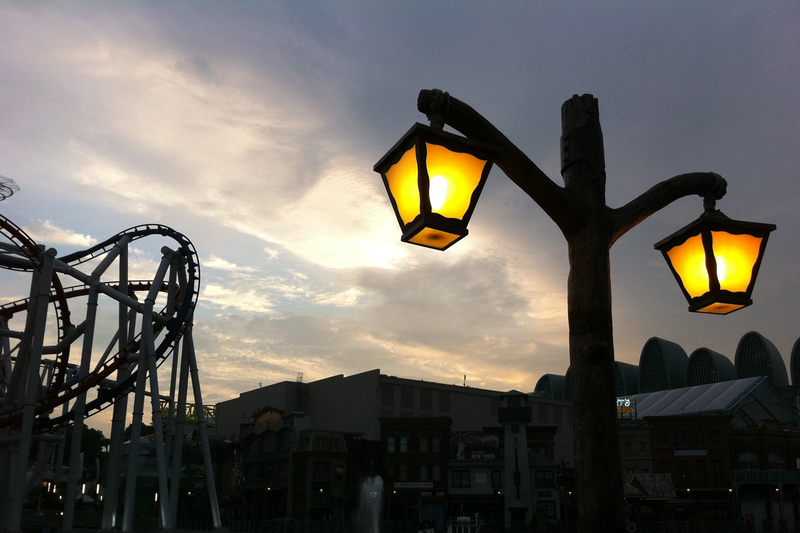 Posted on July 24, 2011, in A Walk To Remember, Picture Perfect and tagged Battlestar Galactica, Caleb Kay, Far Far Away, Gideon Lim, Rudith Yang, Universal Studios Singapore. Bookmark the permalink. 1 Comment.